Donna from Grimsby, Ontario, wrote to say ..... On January 19, 2015 - 8:45 am, I was on the QEW (Queen Elizabeth Way) crossing the Henley Bridge in St. Catharines. Looking to the south on the Twelve Mile Creek I saw the unmistakable white head & tail as a Bald Eagle was flying westward and down toward the water. Unfortunately, as I was on the highway, I could not get a photo nor did I get the chance to see whether it picked up a snack or not. This was my second sighting in the same area at the same time of day - last fall I spotted one from the QEW on the north side around the Sixteen Mile Creek. Very exciting! Catherine from London, Ontario, saw a Bald Eagle in Wortley Village ..... On January 7th 2015 at 3 pm l witnessed a Bald Eagle flying overhead. l couldn't believe what l saw and because it was snowing l was unable to attempt a photograph. Amazing! Gary, also from London, has seen Eagles ..... I have seen the pair at their nest atop a power pole at the corner of Clarke Road& Fanshawe Road many times throughout the summer. But, have not seen them in the last month, do they migrate? If so, from here to what area? 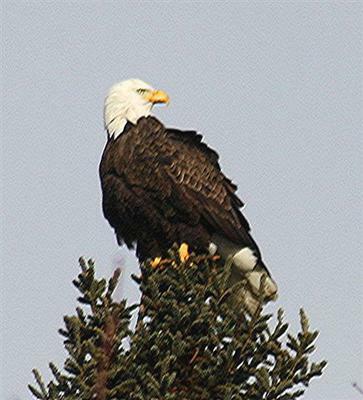 Jan from St Jacobs wrote to say ..... driving home from work at 3:00 pm, I saw male and female Bald Eagles. This was just outside Heidelberg heading to Hawksville. Glenn Dunne from Thornton, Ontario, wrote to tell us ..... I just saw one today January 23 at 930 am, flying west from Thornton, Ontario. I'm going out now to try and get a picture. Nick from Milton wrote to report ..... Twice now I have seen a single Bald Eagle on highway 25 by Louis St Laurant Ave, watching the ducks in the creek. A reader wrote to say ..... I saw a Bald Eagle flying over the Indian River in Warsaw, Ontario, on January 27 2015. Beautiful!! Thank you for writing to tell us about your Bald Eagle sightings, our readers will enjoy these very much! November 2016 saw 3 Bald Eagles in Fort Erie at the end of Buffalo Road flying & hovering in air. I had no idea they are in this area, it was amazing to see. I saw a Bald Eagle this morning on my hike. It was the St Jacobs trail, on the Waterloo side. Really cool to see, I didn't know they were in the area. I saw a Bald Eagle over the Niagara River near Fort Erie today, June 7th 2015. I was heading west just about to cross the bridge on the Western campus at 10:00 this morning and I saw a Bald Eagle flying north.